For a couple of years now, I have been using tent heaters to keep warm inside my tent. These devices have made sure that whenever I use them, I don’t have to sit inside with lots of layers of clothing and I don’t have to shiver inside my sleeping bag. Plus, it makes my guests feel warm and welcome as well whenever I invite them over. To show you just how great these tent heaters are, I’ll show you the best tent heaters available right now and what you should look out for when you are buying one. How to Choose the Best Camping Heater? What Kind of Fuel Source Do You Want for Your Heater? What is the Size of Your Tent? 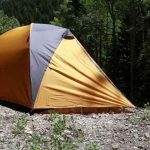 How Safe is the Tent Heater for Your Tent? How Heavy is the Tent Heater to Carry? What I find cool about this tent heater is that it is a light one. It uses 16 ounces or a 14.1 ounce propane cylinder to produce heat for the tent . What this means is that with this tent heater, you can carry it in your bag while you are out there in the woods backpacking. The carrying handle makes the task of carrying the heater easier. As for the safety features, you get an auto shutoff valve. This valve is designed to shut off fuel whenever the flame is extinguished. That means that there is no fuel wasted, nor is there any chance of flammable materials to ignite should there be any electrical problems with the equipment that you are using in your tent that could ignite the fuel. Along with that safety feature is the safety grid and aluminum reflector, which reduces the chances of the heater coming in contact with flammable materials. In terms of stability, the small propane tent heater uses a paddle foot base to make sure that the heater stays still while you are in the tent. No one would want that heater to fall on over and cause damage to your tent and belongings. 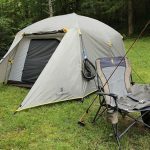 With the heater able to adjust to 2890 BTU with the control knob, this backpacking tent heater is perfect for those who are looking for a small, compact but able to produce a good amount of heat. I have personally used this safe tent heater on numerous occasions whenever I have been camping with large groups. These heaters can produce up to 18000 BTU, with a minimum of 4000 BTU of heat that can be produced. 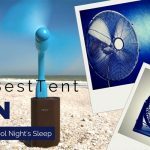 This makes this portable tent heater perfect for those who have large tents. It is so great, that this tent heater can heat up to 300 ft. of space. In terms of safety features, it has an auto shut off if the heater is tipped over onto it’s sides, light is extinguished or the oxygen around the heater is low. This makes it a great device to have in cramped spaces where you know that the tent heater will be safe around flammable objects. I especially like that this tent heater can operate about up to 7000 feet. That means that you can take this tent heater almost anywhere. Three temperature controls help you control the heater in all conditions as well. This is definitely a great heater for those who are camping in large groups. It is quite uncommon to find a tent heater that uses electricity and propane gas at the same time. This one, however, does. What I find so simple about this propane – electrical heater is that the set-up is simple. All you have to do is attach the tent heater to a 12V power supply and a propane tank. Once that is done, you can switch the tent heater on and enjoy up to 40000 BTU’s of hot air in seconds. Transportation is quite easy as well. This zodi tent heater comes in it’s own gear bag. That allows you to carry it on your shoulders as you backpack in the great outdoors. So this 34 pound tent heater should not be a problem for those who hate carrying heavy belongings. To top it all off, this tent heater can connect easily to a five gallon propane tank. This means that you will be enjoying using this tent heater for a long period of time. Especially in those harsh winters when you want a tent heater to keep you warm for very long time. 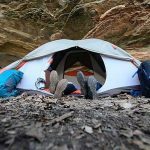 This tent heater is arguably the most space saving tent heater on this list. What makes this heater so special is that it can be hung from the roof of the tent with a 0.5 m ceiling chain. That means that you can save space and you can fit more of your belongings in your tent without the problem of your tent heater. Along with the stylish aluminum design, the halogen quartz heating technology allows heat to be created instantly. Plus it has built in tip over and safety cut outs in case of overheating. This makes this heater just as safe as any other heater on this list. The silent design as well allows the heater to operate quietly while you are doing something great with your time inside your tent. For example, you can read quietly or while you are sleeping. The lack of fumes as well from this tent heater helps a long way with no toxic health problems in store for you. I have got to say, this electric tent heater can produce a fair bit of heat (5000 BTU) for a heater of it’s size. Weighing around 14 pounds this tent heater is compact and can be easily carried around in your back pack. 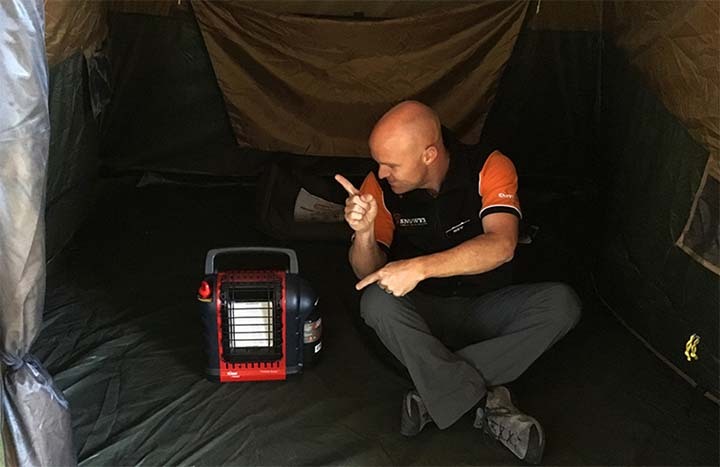 Originally designed to be use inside work tents, this tent heater serves just as well as a camp heater. To be fair though, this tent heater does require a large 120V outlet. 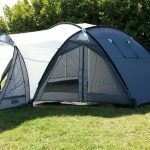 This allows the tent heater to produce around 1500 W of heat, which is suitable for a medium sized area such as a 5-person tent. What I especially like about this tent heater is that is durable. Due to the metal casing, this tent heater can withstand the hard knocks that often comes with camping in nature. If forever reason you drop this tent heater, rest assured that this heater is durable enough to handle that problem. Electric Heaters - These heaters are great because you don’t need to use any kind of gas to power this heater. One of the things, though, about using electric heaters inside your tent is that you have to have a power supply with the heater. If you want to spend a bit of time recharging your battery nearby a place with a plug socket than refilling gas canisters, then choose this option. Kerosene Heaters - Not many people use kerosene heaters these days for heating up their tent. Compared to other kinds of tent heaters, kerosene heaters are expensive to run because of the cost of the kerosene fuel. People who buy tent heaters tend to stick to propane and electric heaters. Propane Heaters - Arguably one of the popular choices for tent heaters on the market. Compared to kerosene heaters, these propane heaters are cheap to run because you don’t need a power supply. Plus, people like that they can keep extremely warm in those harsh winters while using cheap propane. This is one of the overlooked aspects of buying a tent heater. 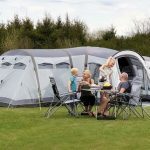 If you are using a 10-person tent, then obviously you would want to get a tent heater that is large enough to keep ten people warm at the same time. That might require you to get a tent heater that uses up a whole lot of fuel. Or, if you are only in a tent by yourself or with one another person, then you might want to focus on a tent heater that only uses up a small amount of fuel for one or two people. Either way, you want to make sure that you get a tent heater that is appropriate for your tent. You don’t want to be spending hundreds of dollars on fuel for two people when you can get a tent heater that makes you spend less money. There are two reasons why you should think about the safety of the tent heater. Combustible Materials - When you are in a tent, you are surrounded by flammable materials such as the nylon or the polyester in your clothes or sleeping bag. Were the heat from the tent heater to ignite the materials in your tent, there would be a serious accident. I have seen incidents where someone has a tent heater that has set their belongings in the tent on fire because the tent heater had electrical problems or the heater was so large, it was near their belongings. Ventilation - Heaters tend to use up a whole lot of oxygen in the tent. If you slept with the heater on at night, then you might experience headaches or, in rare cases, die because of the toxic fumes in your tent. It is important, then, to buy a tent heater that minimizes those ventilation problems. There are many tent heaters that are normally designed to be portable. You can find some tent heaters that can fit right into your backpack and all you have to do is to take the heater out of the bag and turn it on in a suitable spot in your tent. However, there are other tent heaters that are so large, because they are designed to warm up large tents, that you have to transport them directly to your tent site by car or by some other device. What you buy is largely dependent on your budget and the number of people who you are bringing to figure out if you want to get a heavy tent heater or not. We have chosen the electric patio tent heater as our recommended choice from the best tent heaters list. The stylishness, the compactness and the fact that you can suspend this heater from the roof of your tent makes this a great tent heater. Plus, the lack of fumes and the halogen quartz technology makes this tent heater great to use. If you would like to know more about this topic or if you have enquiries, then feel free to ask below in the comments section. All enquiries are welcome.